Stereotactic localization is often the only possibility open to the surgeon for reaching the lesion of interest. Although in fact ah stereotactic interventions use localization techniques, for the purpose of clarity we would hke to discuss separately those lesions, which after localization can be treated by aspiration or microsurgical resection. One reason for this subdivision is, that these lesions are not necessarily tumors, and that the pertinent hterature on this subject shares only the localization technique with stereotactic diagnostics. 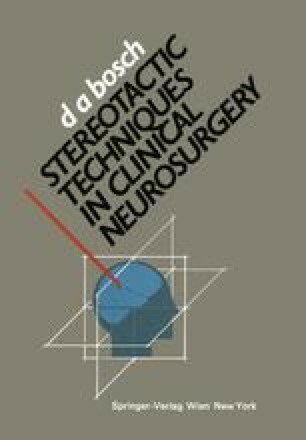 The main reason, however, for setting the lesions apart, which nowadays can be treated with combined stereotactic and microsurgical techniques, is the evident progress made possible by this methodology in chnical neurosurgery. A new era wih be ushered in in cerebral lesion management with the methodological advances in this field.